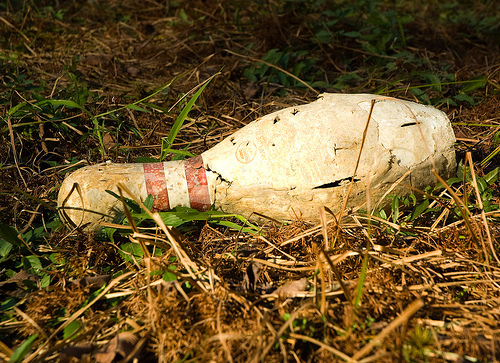 How did this bowling pin get lost in the woods? What’s inside a bowling pin? Have you ever seen a bowling pin factory? Did the guy who took this take the bowling pin with him? Could it have been used as a weapon? I can’t answer these questions alone. Bowling pins are made from wood (hard rock maple would be my guess) then they are coated with some plastic layer. That bowling pin lost its way in the woods. It looks like it got attacked by a bear, or maybe a wolverine. This bowing pin was dropped by a juggling chimp on his way to the “insert country name here” got talent contest. It goes without saying he lost as anyone can juggle 2 bowling pins.